This week marks the Shaheedi Diwas (Martyrdom Day) of Guru Arjan Dev Jee. Guru Jee laid down the tradition of living in dignity and dying with honour, and paved the path for the tradition of martyrdom in Sikh history. 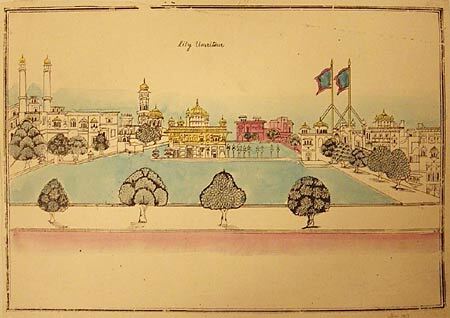 During Guru Arjan Dev Jee’s time the Sikh community flourished and Amritsar was becoming a strong centre for the Sikh People. More and more people of all castes were embracing the Path of the Guru and becoming Sikhs, which included Hindus and Muslims. The Muslim priests did not like this and saw Guru Arjan Dev Jee as a threat to the propagation of Islam. As a consequence of this they made plans against Guru Sahib. 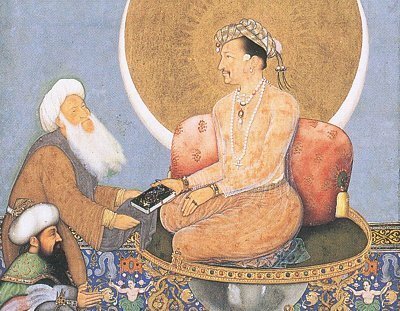 After the death of Mughal Emperor Akbar in 1605, his son Jahangeer sat on the throne. Unlike his liberal, tolerant and open-minded father, Jahangeer’s policies and views were to fanatical and radical in pursuit of spreading Islam. The enemies of Guru Sahib took advantage of this highly charged atmosphere.Prithi Chand: To begin with, it was Guru Sahib’s elder brother, who devoted his whole life to harm the Guru in every possible way. Chandu Shah: He was the Brahman advisor and officer of Jahangeer. He held animosity over his daughter’s non-alliance with the Guru Sahib’s son, which is considered the main fuel for his vendetta. Naqshbandi, Sheikh Ahmad Sirhindi and Sheikh Fareed Bukhari, (Murtaza Khan), Governor of Panjab: Zealous Muslims who were jealous of the growing popularity of Sikhi and considered Guru Arjan Dev jee and the Sikhs a threat to the growth of Islam. Mahesh Daas Bhatt (known as Birbal): An anti-Sikh Hindu Brahmin, who considered Guru Arjan Dev jee a threat to Brahmanism. These men with jealousies in their hearts, concocted the real story of Guru Sahib sheltering the rebellious Khusro, Jahangeer’s son, who had fled a battle with his father and was a fugitive, to rouse the rage of Emperor Jahangeer which added fuel to the blazing fire. Along with these circumstances Guru Sahib’s increasing influence on large numbers of Hindus and Muslims to adopt Gurmat, created a stir in the minds of the Brahmin Pandits (Hindu priests) and the Qazis (Muslim priests). The compilation of Sri Aad Granth jee (the early version of Sri Guru Granth Sahib Jee) was considered a serious blow to the monopolies and social oppression maintained by so-called men of religion. Through all these circumstances Guru Arjan Sahib Jee fell a victim to the bigotry and inhumanity of Jahangeer. “In Goindwal, which is on the river Biyah (Beas), there was a Hindu named Arjun, in the garments of sainthood and sanctity, so much so that he had captured many of the simple-hearted of the Hindus, and even of the ignorant and foolish followers of Islam, by his ways and manners, and they had loudly sounded the drum of his holiness. They called him Guru, and from all sides stupid people crowded to worship and manifest complete faith in him. For three or four generations (of spiritual successors) they had kept this shop warm. Many times it occurred to me to put a stop to this vain affair or to bring him into the assembly of the people of Islam. Chandu, the officer of Jahangeer, was in charge of torturing Guru Sahib. Guru Sahib told them, “I bear no enemies or ill-will against any one. All happens as God Almighty wills it to happen. I am prepared to accept His Will. You may do what you like”. Day 1 of Torture: Chandu began to torture the Guru. On the first day, Guru Jee was not given anything to eat or drink. He was kept awake and not allowed to sleep at night. During the day his body was left in the full exposure of the burning heat of the sun. Guru Sahib bore all this calmly. He remained immersed in Simran and repeated from his lips, “WaaheGuroo, WaaheGuroo, WaaheGuroo…” and sang Shabads from Gurbaani. Day 2 of Torture: On the following day, Chandu made the Guru sit in a large copper vessel. He filled the vessel with water. He ordered his men to light a fire under the copper vessel. The water began to get hot. After a time, the water began to boil. It scaled Guru Sahib’s body. But Guru Jee sat calmly and quietly. He showed no feeling of pain, nor did he cry out or even sigh. He felt no anger against those who were torturing him. He remained absorbed in the sweet remembrance of Waheguru and repeated, “All is happening, O Waheguru, according to Thy Will. Thy Will is ever sweet to me.” The boiling water made the Guru’s flesh soft and left blisters all over the body. O WAHEGURU! YOUR ACTIONS SEEM SO SWEET TO ME. Day 4 of Torture: On the fourth day, Guru Jee was made to sit on an iron plate. It was heated from below. The iron plate became red hot with the heat. 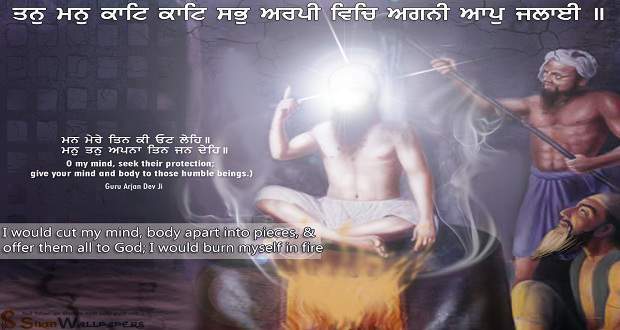 Guru Jee’s flesh began to be roasted. Burning red-hot sand was poured on his body. Guru Sahib sat calm and quite, without a cry or sigh, feeling no physical pain. He sat with his mind fixed on Waheguru and physically living the message of Gurbaani and accepting the Will of Waheguru sweetly. Day 5 of Torture: On the fifth day, Guru Sahib was taken to the bank of the River Raavi bounded in shackles. Guru Sahib’s physical body was covered with burns and blisters. Guru jee was pelted with rocks. One rock hit Guru jee on his forehead which led to bleeding. Two drops of blood fell to the ground. Jahangeer had given strict orders that Guru jee should be tortured to death in a such a way that his blood should not fall on the ground in the belief that a holy or great man’s blood spilling on the ground leads to further martyrs being born. This tradition was called Nasar law and was upheld by Genghis Khan. To hide the bloodied body of Guru jee, the soldiers threw Guru jee’s body in the River Raavi and then concocted a story that Guru jee went to bathe and never came out of the river. This fake story was used to firstly, make the martyrdom into a suicide case and ensure that people do not revolt in response to the barbaric martyrdom of Guru jee. Guru Arjan Dev Jee sowed the seed of martyrdom which flourished after him and became the heritage of the Sikh People. Guru Sahib physically manifested and lived the Divine message of Gurbaani of conquering death and suffering, remaining fearless in defending the Truth, and showing the extremes one can take in remaining steadfast in the love of Waheguru and Guru Nanak Jee’s Sikhi. Guru Arjan Dev Jee said, lived, and showed that he can accept Shaheedi (martyrdom) but he cannot accept insult. The way a leader or prophet lives becomes the character of the followers. Guru Sahib showed that a Sikh should live in dignity and die with honour, and that a Sikh should never tolerate insult or oppression.